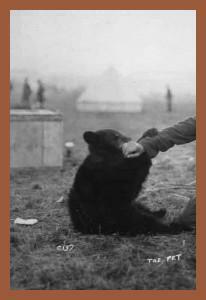 One hundred years ago, the community of White River, Ontario, Canada, bid farewell to a little black bear cub, not knowing at the time that this bear would become the inspiration of author A.A. Milne. This is her story. Winnie was found by a trapper, and he brought her back to White River. At this time World War I was taking young men from their homelands. White River was a half-way point between Winnipeg and Toronto, where trains and troops would stop to refuel. A soldier riding out of White River wrote in his journal the following passage: “August 24, 1914. Left Port Arthur 7A. In train all day. Bought bear. $20.” This young man was Harry Colebourn. He had purchased that small bear cub from the trapper and named it Winnie after his hometown of Winnipeg, Manitoba. Lieutenant Colebourn’s destination was England. 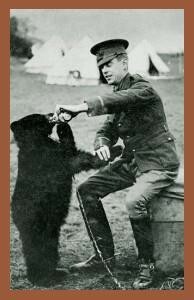 Winnie travelled with Colebourn and became a pet to the Second Canadian Infantry Brigade. In December 1914, Colebourn received news that he would soon be posted in France. He knew Winnie would not be able to accompany him, so he made arrangements to keep her in the London Zoo until he returned. Winnie soon became a favorite attraction for everyone. Above: Video of Winnie in her habitat in the London Zoo, included with permission from Mary Anne Appleby. 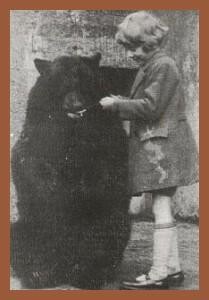 Winnie captured the hearts of many visitors including A.A. Milne and his son Christopher Robin Milne. Milne’s first edition of Winnie the Pooh stories, illustrated by Ernest Shepard, came out in 1926.